Brothers and Sisters in Christ we have been warned through Jesus’ battle that a battle also awaits us, however we have been assured that we can victorious because he was victorious. All that remains for us to examine is the weapons in his hands through which he triumphed. Before examining these weapons let us consider His preparation for the battle. This will help us to gain understanding as to what we have to do so that the tempter finds us poised against his attacks, for this is half the victory. First let us avoid a misunderstanding of imitation that substitutes the letter for the spirit. In order to be conformed to the example of Jesus preparing for victory in the wilderness, we will not go into the wilderness to flee from temptation, and in order to conform to the example of Jesus fasting for forty days, we will not impose an annual forty-day fast. This does not arm oneself against temptation it just merely exposes oneself to it. We must remember a principle that an imitator of Christ should never lose sight of; to imitate is not to copy. Jesus was “filled with the Holy Spirit” (Luke 1:15) after he “had been baptized and was praying” (Luke 3:21). There is the secret of his strength. Therefore, let us “pray without ceasing” (1 Thessalonians 5:17) in order to “be filled with the Spirit” (Ephesians 5:18), because to be “full of the Spirit” is also to be full of “wisdom . . . faith … and power” (Acts 6:3, 5, 8). Jesus was proclaimed by God to be “his beloved Son with whom he was well pleased” (Luke 3:22). This designation not only marks him for Satan’s attacks but strengthens him against them by allowing him to address himself to God as a Father who always hears him (John 11:41-42). We, too, need “the Spirit” to bear witness with our spirit that we are the children of God” (Romans 8:16). This exposes us more to the enemy’s assaults, but it also makes us better able to resist him. “For everyone who has been born of God overcomes the world” (1 John 5:4). Jesus is “led by the Spirit” to face temptation; he doesn’t enter of his own will. This is the source of his confidence. Where God guides, God will guard. Let us not seek danger. It cost Peter dearly to defy the warnings and force his way through (John 18:15-16), entering into the very temptation to which he was foreseen to yield. Let us do our best to be spared from temptation, but if we cannot be spared, then let us fight in like manner as Christ. Jesus fasts before and during the temptation. This fast, which the devil uses against Jesus, also strengthens him against the devil. The point is that Jesus fasts while praying and in order to pray. His fast is explained to us by that of Moses, who on two occasions “lay prostrate before the Lord forty days and forty nights.” He “neither ate bread nor drank water” (Deuteronomy 9:9, 18). Fasting is either abused or neglected. Jesus and his apostle’s use show us a way to battle temptation – a way that is sometimes necessary. “This kind cannot be driven out by anything but by prayer and fasting” (Mark 9:29). This deprivation of food is linked to a more general fast that consists of mastering the flesh and its instincts, and that is always appropriate. “But I discipline my body and keep it under control” (1 Corinthians 9:27). “Make no provision for the flesh, to gratify its desires” (Romans 13:14, see also Luke 21:34). Satan’s point of attack is the flesh, so when the flesh is held in check, he has nothing to lay hold of and loses his power. With Jesus now prepared let us follow him as he faces the enemy, and let us familiarize ourselves with the weapon that assures him victory. Yes weapon? Singular and not plural. Jesus does not need an arsenal of varied weapons. He has one weapon that is sufficient for every incursion. This weapon is known as “the Sword of the Spirit which is the Word of God” (Ephesians 6:17). 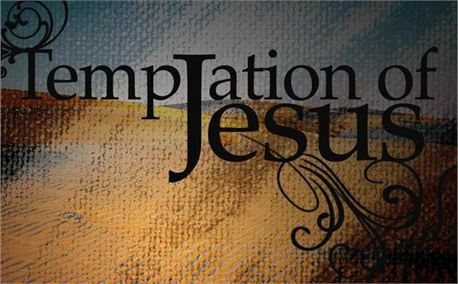 Three times tempted and three times he repels the temptation with a simple quotation from the Scripture, devoid of any commentary or exposition. “It is written” draws our Sword from is scabbard in retaliation. “It is written” is our resistance to Satan’s attacks until he withdraws. God’s Word is the weapon that Satan dreads most because it is a weapon before which he has always been forced to yield. Paul calls it “the Sword of the Spirit” (Ephesians 6:17). Similarly, Hebrews 4:12 says, “The Word of God is living and active, sharper than any two edged sword, piercing to the division of soul and of spirit, of joints and of marrow, and discerning the thoughts and intentions of the heart.” With the Sword of the Spirit in our hand, our cause will be that of the Holy Spirit himself, and we will prevail against our adversary as God’s Spirit prevails against the spirit of darkness. Adam succumbed because he let his sword fall; Jesus triumphed because nothing could pry it from his hand. Jesus could have gone against his enemy with a new sword brought down from heaven but he chooses to arm himself only with our sword. His choosing of this has been discussed in prior weeks but as way of reminder he does so to serve as an example for us. We learn what the sword can do in our hands by what it does in his hands. Therefore let us, oppose every attack of the adversary with a simple “it is written”, and we will render all his efforts vain. Satan seeks to conform us to this world’s pattern (Romans 12:2). He is most clever at this work. He slides up next to us and points out that it is unloving to oneself to work at keeping yourself “unstained by the world” (James 1:27). He will suggest that you are better able to win men to the Gospel by participating in their entertainments and amusements, thereby showing them that you do not advocate a monastic life. He will also lure us by telling us that too much caution is unbecoming of one who is training himself in Christian virtue, and that overcoming without risk one triumphs without glory. Do not defend yourself with your own reason or you will be easily persuaded, because your natural heart is in far too much agreement with his arguments. Arm yourself with the Sword and respond by saying; “It is written, “do not conform to this world” (Romans 12:2). This word Scripture will put everything into place as it unmasks his malice and brings about defeat. How does Satan attack a pastor like me? He counsels me not to appear so resolute about issues such as heresy, the narrow road to heaven, or the wide road to hell. He contends that to placate to all would gain the pastor his parishioner’s good graces and would thus allow him to lead them more surely to faith and to make a more fruitful use of the gifts that heaven has granted him. This counsel has failed many preachers as they have endeavored to fight this temptation in their wisdom. He is ever making “evil good and good evil” or putting “darkness for light and light for darkness” (Isaiah 5:20). Such temptation is defeated as “it is written, if anyone is preaching to you a gospel contrary to the one you received, let him be accursed” (Galatians 1:9). May our Lord grant us an understanding of what his Word can accomplish! May we see the terror it inspires in our adversary! If we could only follow him behind the scenes to hear him confess to his accomplices that he is lost unless he can make this irresistible weapon fall from our hands! If we but understood all this we might follow in the footsteps of Eleazar as he held on firmly even though his “hand was weary . . . he clung to the sword” (2 Samuel 23:10). For us to do likewise would make us invincible! When we have the Word of God in our hands we hold the same power that Jesus had in his. Jesus use of Scripture speaks loudly and emphatically in support of its inspiration. Jesus who was one with the Father (John 1:18) could have easily drawn from his own inner resources instead prefers to borrow what he needs from the book he finds in our hands and to find his strength where Joshua, Samuel, and David found theirs. How can we explain this astonishing mystery, this prodigious reversal unless the word of Moses was for Jesus; “not the word of men but the Word of God” (1 Thessalonians 2:13). How can we explain it unless he was fully persuaded that the holy “men spoke from God as they were carried along by the Holy Spirit” (2 Peter 1:21)!